Swift | Swift Group of College Affiliated to PTU |Swift Punjab|Punjabi University |Chandigarh|Rajpura| Punjab| north India. 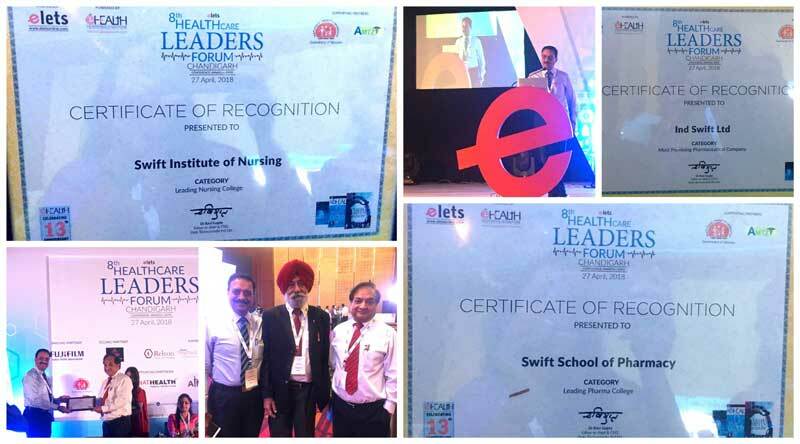 Elets Technomedia Pvt Ltd organised 8th edition of its prestigious "Healthcare Leaders Forum (HLF)" in Chandigarh on 27 April 2018. Aim of this conference is to bring together leading healthcare brands together to discuss and deliberate upon various aspects of building quality healthcare ecosystem with special focus on the healthcare scenario in Chandigarh and Northern India. In this conference Swift Institute of Nursing and Swift School of Pharmacy received "certification of recognition" in category "Leading Nursing College" and "Leading Pharma College" respectively and Ind-Swift Ltd was awarded as "Most Promising Pharmaceutical Comapany".